Talk 1: Overview of Vajrayana, July 12, 3 h. 10 min. 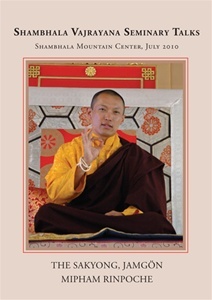 Talk 2: Shambhala: The Path of Skillful Means, July 16, 2 h. 30 min. Talk 3: The Great Mandala Offering, July 17, 43 min. The 3 DVD-set comes with a five-session syllabus, available as a PDF file on the first DVD. It is intended particularly for use in vajrayana practice intensives and group study situations.